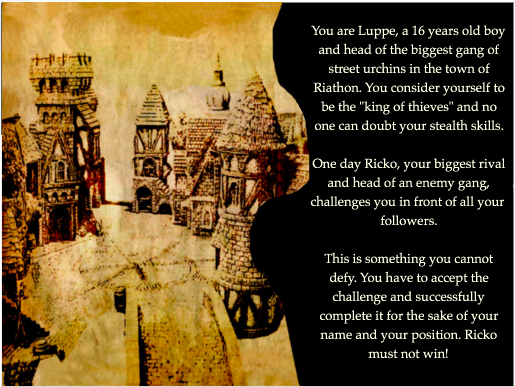 “You are Luppe, a 16 years old boy and head of the biggest gang of street urchins in the town of Riathon. You consider yourself to be the ‘king of thieves’ and no one can doubt your stealth skills. One day, Ricko, your biggest rival and head of an enemy gang, challenges you in front of all your followers. This is something you cannot defy. You have to accept the challenge and successfully complete it for the sake of your name and your position. Ricko must not win! Lord Amatar. A scarcely seen lord of the town whose name is surrounded by mysterious rumors. Some believe he is a dark wizard, others believe he is something worse, a lich or a powerful and sinister vampire. All of them try to keep themselves as far from his house as they can. 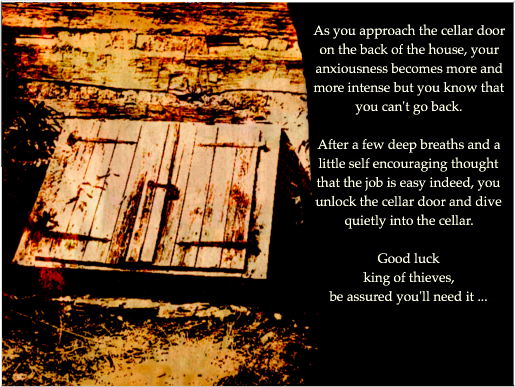 It’s his house that you need to enter quietly and steal the wine. Quite easy it seems for a thief of your caliber, yet you feel rather uncomfortable even just thinking of it. The name of the game? Not yet finally decided, but it will be something like Spell Craft or Spellbind (I, myself, prefer the latter over the first). It will be a 2D adventure game for the iOS and Android platforms at first, but with a plan for porting it to the desktop machines also (PC and Mac). Its perspective will be first person just like Big Fish’s games. We use the Corona SDK for the development. Its simplicity as an API and the fact that we already have had some experience in developing applications with that, made our decision easy. Corona’s API seems to be rather sufficient for our needs, Lua is actually a wonderful (and powerful too!) scripting language and so far, we didn’t encounter any problems with the prologue development. Before long, I will be writing some technical posts regarding programming stuff, so that’s it for now. ← Welcome to the development blog of Spider Key Games.